Based on the best-selling game, Devil May Cry 3 is an action-packed adventure, pitting good against evil... and brother against brother! 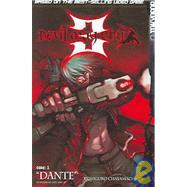 Dante is a demon slayer and bounty hunter with a demon heritage of his own that haunts his past. He's currently unemployed - and bored to death. Opportunity knocks in the form of a missing-child case, which his friend and manager, nzo, offers him. But a four-million-dollar reward, an unexpected demon attack and a little girl named Alice all conspire to send Dante through the looking glass on a nightmarish adventure beyond his wildest imagination.